Mojacar is the most well known tourist resort on the Costa Almeria in Spain and along with neighbouring Carboneras, Vera Playa and Garrucha offer some of the best nightlife, restaurants and beaches. Why Rent a Car in Mojacar? Tourists find that Mojacar has something for everyone especially when it comes to its beaches and beach club. In Mojacar you can get a taste of the exclusive beach club culture of Marbella at the Mandala Beach Club. There is so much to see in the Costa Almeria area outside of Mojacar for example there are nearby beach resorts of Garrucha and Vera Playa which is Spain’s premier naturist resort and golf at the Club Marina Golf Mojacar. The actual town of Mojacar (the Pueblo) is located a few kilometres inland and the modern beach resort (Mojacar Playa) has around seventeen kilometres of golden sandy beaches. The best beaches in Mojacar to enjoy include the Las Granatillas Beach, El Sombrerico Beach, Castillo de Macenas Beach, Cueva del Lobo Beach, El Cantal Beach, El Descargador Beach, La Murina Beach and the Marina de la Torre Beach. Although Mojacar is a very popular tourist resort there are no airports in the immediate vicinity and tourists have the choice of flying into Almeria Airport which is the closest and in some cases Murcia Airport if there is a very cheap Ryan Air flight available. Almeria Airport is eighty kilometres away with a transfer time of roughly an hour which isn’t too bad, while Murcia Airport is just over one hundred and fifty kilometres away with a transfer time of roughly two hours (as seen on this Mojacar map). Most people wouldn’t choose a taxi as the best way to get to the resorts from either airport given the distance, but taxis are often the easiest and quickest way to get to Mojacar. To catch a taxi fare from Almeria Airport would cost roughly €85 and from Murcia Airport around €170. You have to remember though that you can expect to pay the same again on your return journey. Shuttle Services are similar to taxis with the difference that it is booked in advance and that you will be met by your driver in the arrivals hall. With a company such as http://advanced.shuttledirect.com you can expect to pay £145 for a family of four during the month of July from Almeria Airport to Mojacar and £365 for a family of four from Murcia Airport during the same period. Looking at car hire most people would choose to hire a car directly at the airport and at Almeria Airport car hire companies to compare rates with include Auriga Crown, Avis, Centauro, Europcar, Goldcar, Hertz and National Atesa. At Murcia Airport you can choose directly from Auriga Crown, Avis, Centauro, Europcar, Goldcar, Sol-Mar and Victoria Rent a Car. Car rental rates are also seasonal meaning you can expect to pay more during the months of July and August than at any other time and these cars do need to be booked at the same time as flights and accommodation not only to ensure the best and cheapest deals but also that you can rent one and not that they are all sold out! As different car companies have different requirements which allow you to rent a car for a week from then it is always best to know exactly what obligations you have to fulfil at your end. You might be asking yourself what the person serving you at the car rental desk will want to see from you. All rental company agents have to ask to see your passport, drivers licence and the credit card with which you have made your car rental reservation. You have to be at least twenty-one years of age to rent a car and in some cases twenty-five years of age. Again that varies from company to company. You might be asking yourself what is actually included in a basic car rental agreement? You are fully insured in the event of an accident, although if a visit to the hospital is required you will have to pay for all necessary treatments and medicines unless you have taken out a travel insurance policy. You are fully insured if you do cause an accident, but the insurance doesn’t normally cover smaller items such as lost keys, chipped windows and punctured tyres. For peace of mind you can opt to pay a small charge for this additional insurance. What happens if I need to cancel my holiday as well as the car rental? Most car hire firms offer you a full refund although some may charge you a small administration fee. Is petrol included in the price of my rental agreement? As different car rental firms also have differing fuelling policies you should choose one which best suits your needs, which means that if you are on a very late flight the last thing you want to worry about is filling your car because most petrol stations shut at ten at night to reopen the next day at six. Also good to know where the nearest petrol stations are located. At Almeria Airport the nearest petrol station is one kilometre away which is handy if your deal includes having to refuel the car before dropping it off and also if you need to fuel the car to get going. At Murcia Airport you will have to drive into the town of San Javier itself to fill the vehicle which is approximately six kilometres away. Either way make sure you refill the car if that is part of the contract otherwise you may be charged as much as €100. Families with small children have the choice of bringing their own baby and or booster seats or hire them directly from the car rental firm. Sometimes it is just easier to leave them at home and hire one for €3 a day or bring your own seats if you are worried about demand and supply. The maximum any rental company would charge you would be €42 for two weeks and longer vacations. What happens if I break down while I am on holiday? Rental car companies are constantly servicing and purchasing new vehicles so that scenario is very unlikely and in any case a twenty-four hour break down service is always part of the deal which will give you peace of mind especially late at night. Am I able to share the driving while I am on holiday in Mojacar? Many car rental firms will allow you to put a named driver on the contract completely free of charge when they are offering huge discounted deals. The person you would like to put on the contract as a named driver will need to present their drivers license as well at the time of collecting the vehicle. What will happen if I get a parking ticket or a speeding fine? If you happen to be unlucky enough to be issued with any fines and let the rental company know on returning the vehicle, they will usually quietly deal with the matter and maybe charge you an admin charge. If you don’t let them know they will charge the fine to your credit card with a hefty surcharge. If I am late returning the car to the airport will I be charged for another day? It is always best to return the car at the agreed time, although the rental company will usually allow you to return the vehicle up to two hours later than the stated on the contract, should you go over that time you will be billed for another day, as the vehicle can then not be rented out immediately to the next customers. Is it possible to hire a GPS while I am in Spain? Rented vehicles in the more luxurious categories come with a GPS as standard, but you can either rent a GPS in the U.K. from as little as £30 a week or look to rent one locally from the car hire company for as little as €5 a day. Should you want to visit the Sierra Nevada for a day of skiing in the winter months you can rent snow chains and ski racks, as well as roof racks and boxes for additional storage space. The main things to look out for when renting a car are air conditioning, boot space, what is included in the insurance and petrol! Everything else is up to the individual and personal choices. Looking at hiring a car at Almeria Airport in the peak month of July works out at €248 for a two week period in an economy car such as a Citroen C2 3 ideal for a couple, €457 in a mid sized family car such as a Renault M Scenic and €944 for a people carrier such as a Ford Galaxy 7 Seater. From Murcia Airport during the same period you can hire the same cars for a little less, so it does depend which airport you fly into, rates do differ. A Citroen C2 3 with cost €215 for a two week period, €572 for a Renault M Scenic and €891 for a Ford Galaxy 7 Seater. Car hire is seasonal as well so you will pay far less at other times of the year and the highest rates during the peak months of July and August when the seaside resorts are at their busiest. It is interesting that rates fluctuate during the same period with the same car hire company from different airports. The key is to book as early as possible in order to secure the best deals in the peak tourist periods. Car hire does seem to be the way to go for holidaymakers visiting Mojacar given the poor transport infrastructure and distances from both airports but there are some people who just don’t want to hire a car for the entire duration of their stay and prefer to take it easy. Nevertheless they may enjoy visiting the neighbouring resorts of Garrucha, Vera Playa and Carboneras and can hire a car locally for a day or two to do some exploring. 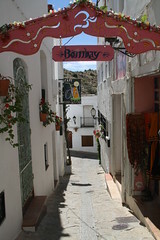 Mojacar has quite a few local car hire companies so it is easy to shop around for the best deals in person. Crown Rent A Car S.L. Having looked at all the options pertaining to renting a car for a holiday to Mojacar I would definitely hire one at the airport with a full tank of petrol and refill it just before dropping the car off again.